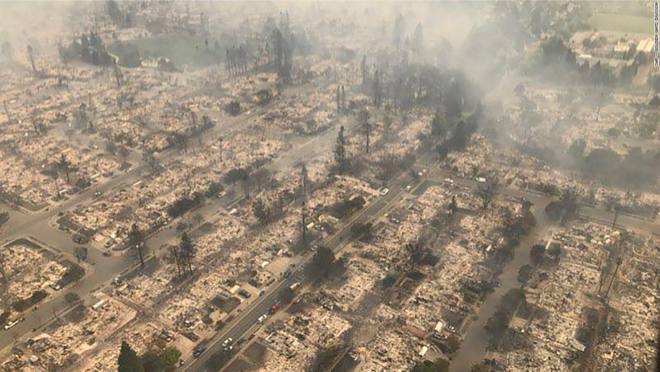 More than 5700 structures and 200K acres burned in Santa Rosa 41 Dead. It looks like Hiroshima. Houses burned but not trees? Electronic malfunction.Was this fire caused by a direct energy weapon? At first, I was skeptical, but I went over numerous social media posts, several videos, and a few messages and it appears the fires were set by an atmospheric weapon. First, to clear something up – the manner in which the cars burned was normal. But there are some instances with what went on that prove a weather weapon did this. Weather weapons work by using multiple transmitters to create a collision zone where differently phased EM waves cancel each other out, and drop their electrical potential into the air (which is a semiconductor) where they cancel. This is the equivalent of biasing a transistor. Semiconductors won’t simply break down and start conducting just because a bias field is applied, in order for them to conduct in a controlled fashion they need a doping agent. In silicon, the doping agents are arsenic and boron. In air, the doping agent is most likely whatever is in the chemtrails. The ionosphere is the power supply, and earth is “ground”. Everything in between the ionosphere and the ground will heat up. Evidently, the people running the geoengineering systems have become more bold, like a thief that steals more and more and more, the more the thief gets away with stealing. The same is happening with weather warfare, and this time around in California, they got bold enough to push the system hard enough so that the effects of the system in use were easily observed. Some people got heart palpitations from having their bodies charged.